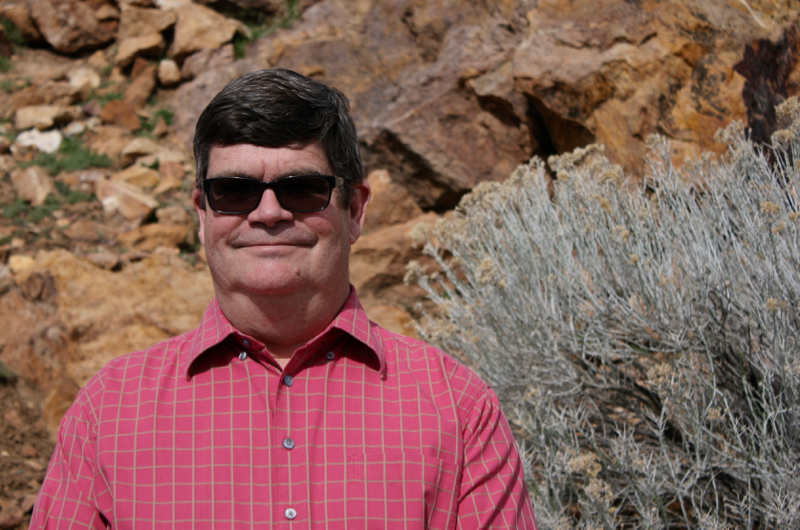 In Episode 2 of the Native Waters on Arid Lands podcast, we sit down with Dr. David Rhode to learn about the archaeology and paleoecology of the Great Basin and American Southwest. Dave is a Research Professor of Archaeology at the Desert Research Institute in Reno, Nevada, and studies prehistoric environments and cultures in Western North America. Listen to the podcast and read below to learn more about Dave and his work. A written transcript of this interview is available here. You can also subscribe to our podcast via iTunes or Google Play. 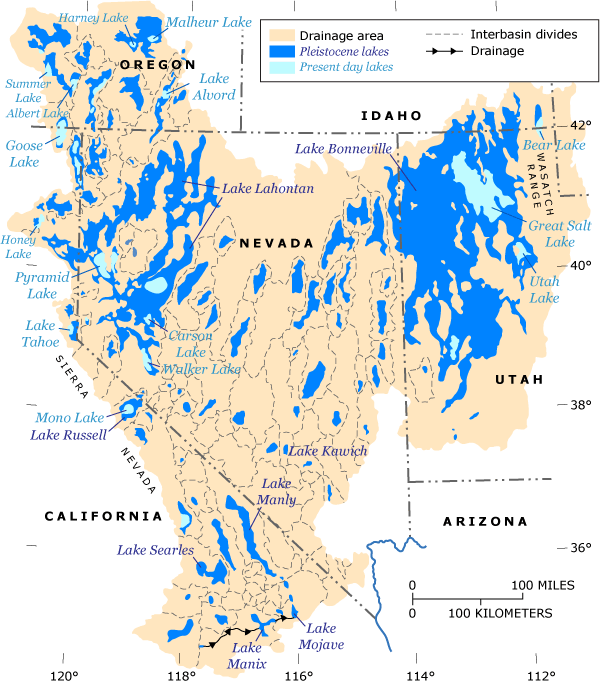 Map of Pleistocene Lakes of the Great Basin. Image source: USGS. 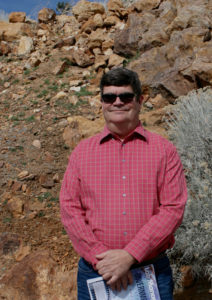 As an archeologist and paleoecologist with the Native Waters project, Dave uses evidence from archaeological sites, fossils, pollen samples gathered from lakes and bogs, packrat nests, and tree ring records from bristlecone pines to learn about how the environment in the Great Basin and American Southwest has changed over time, and how humans from ancient cultures lived and adapted. 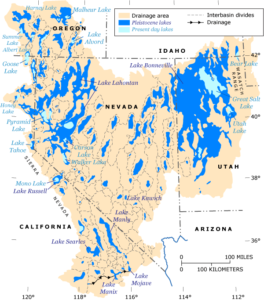 At the time of the last glacial maximum — about 20,000 years ago — the Great Basin was a much cooler and wetter place, with lakes and forests covering much of the area that is now desert. Today, much has changed. Great Basin Bristlecone Pines, White Mountains. CC image courtesy of Laura Camp on Flickr. Dave and other researchers with the Native Waters project are looking to the past for clues about how ancient cultures lived and adapted under changing climatic conditions, with hopes that certain traditional agricultural practices or adaptation strategies may be useful again in the present or future. As Dave explains in the podcast, humans have been present in the Southwest and Great Basin for at least 14,000 years, and have survived extreme changes in climate, including multi-decadal droughts. Agricultural communities of the southwest such as the Hopi and Tohono O’odham survived by developing strains of maize that were adapted to a variety of different environments, and by farming domesticated varieties of squashes, beans, cotton and agave. Wild crops such as pine nuts, small seeds and mesquite pods were important food sources as well, and could be cultivated by pruning, broadcast sowing, irrigation and other horticultural practices. Domesticated animals included the dog and the turkey. As climate changed, ancient societies sometimes responded by migrating — abandoning certain areas for long periods of time, sometimes never to return. Other adaptive responses included changes in diet, changes in how much land they cultivated, changes in what kinds of crops they cultivated, and changes in how much they traded or interacted with their neighbors. 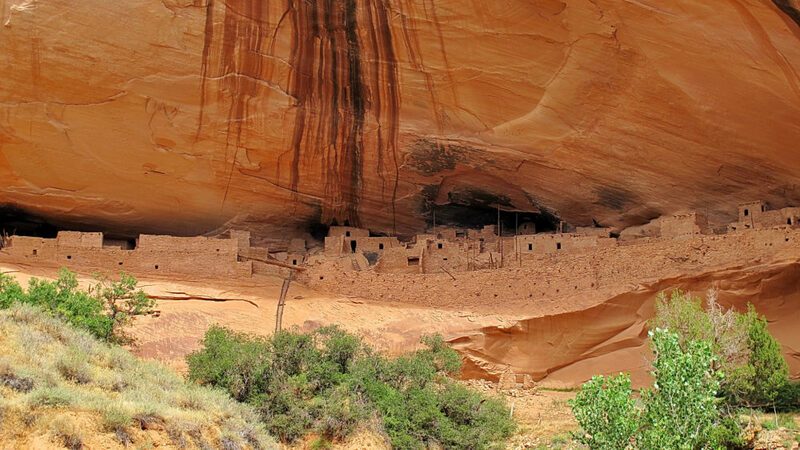 Cliff dwellings at Keet Seel, Navajo National Monument. CC image courtesy of Alan English CPA on Flickr. To learn more about Dave’s work with the Native Waters on Arid Lands project, listen to podcast episode 2, below. Music for this podcast came from Podington Bear (song title: Bit Rio) on the Free Music Archive under a Creative Commons license. For a written transcript of this podcast, please contact kelsey.fitzgerald@dri.edu.